I love this toast and it kind of came around by accident as I was playing around in the kitchen -- honestly that's how so many dishes come about. You start with an idea and allow things to organically develop while you're in the kitchen. Anyways, this Tuscan Egg & Stewed Bean Toast is a guaranteed way to impress that special someone with an insanely delicious breakfast. I hope you guys enjoy and I'd love to hear your comments! Begin by heating a pan over low heat and sweating out your minced garlic in a 1 T butter until translucent. Then add onion and cook until translucent. Add tomatoes and cook until liquid has evaporated and mixture has turned into a stew. Add flour (which will eventually be our thickener later on in the process) and stir to fully incorporate. Add beans (should be rinsed off), then veggie stock and reduce until stew has thickened. Heat a separate pan over high heat. Once pan is hot, add a small amount of canola oil and sauté kale until cooked through. Hit it with a little salt and lemon juice to taste. Once cooked, stir into your stewed beans. Heat a cast iron pan over medium heat. While the pan is heating, put a little canola (or olive oil or butter) on each side of the bread and season both sides with a little salt. Once the pan is hot, place the bread in the pan and cook until golden brown and crisp on each side. Heat a pot of water to around 180 degrees F (poaching temperature is 160-180 F; when poaching, I like to go to the higher end because once food is introduced, it will automatically reduce the liquid temperature). Add white vinegar and a pinch of salt to the water. Once at 180 F, gently stir the water to create a whirlpool then add eggs one at a time and cook until the whites are fully cooked and the yolk has a slight spring to the touch. *Adding vinegar to your poaching water will help keep the egg intact and in tight form. Don't worry about tasting it - you won't! 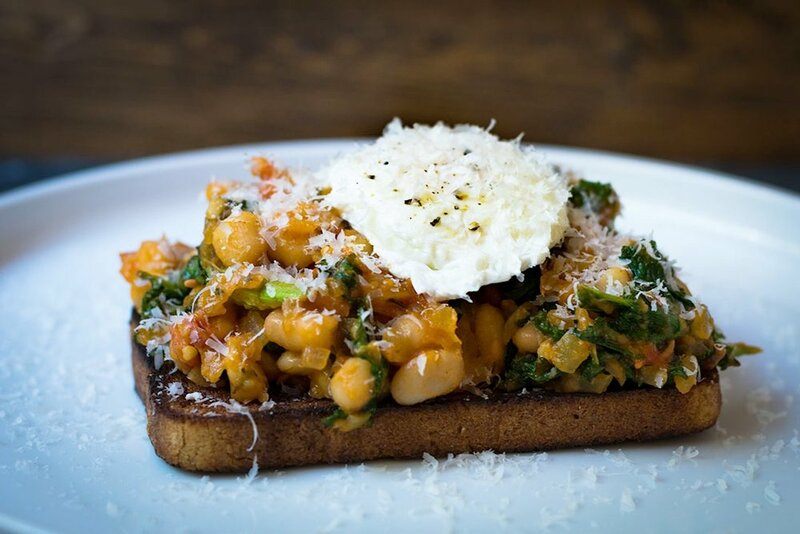 Place your toast on the plate then top with a generous heaping of stewed beans and kale, then top with poached egg (hit it with a little cracked pepper) and some freshly grated parmesan.